One of my friends from high school contacted me on Facebook last week saying I seemed like a healthy mom and could I help her find some good recipes she could make with her pre-school class. (side note: I am always amused when people pick me out of crowds, including facebook, as "the healthy mom." Or "the kind of person who would use cloth diapers." I swear, I don't wear gypsy skirts or own anything made of hemp. Maybe someone I know in real life can tell me how I put out this vibe. But I digress...). My little guy loves helping me in the kitchen and has his own little apron he likes to wear when he helps. 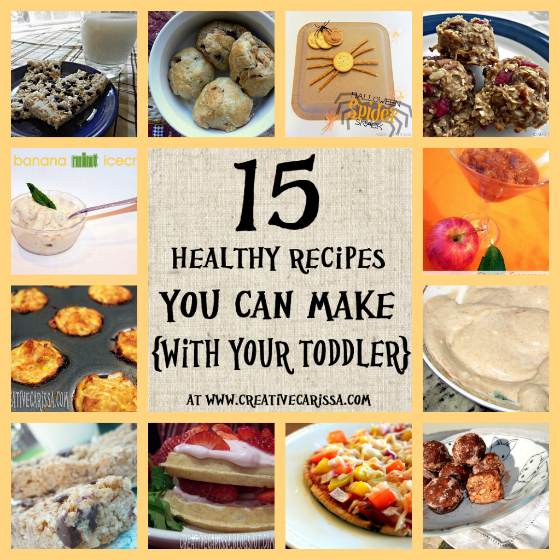 I realized when my friend asked, though, that I hadn't focused much on my blog about food you can make with your toddler. What a great idea! 1: Chewy Chocolate Coconut Bars from Mad in Crafts. Have your kids help you mix the ingredients and let them have fun packing the granola down into the pan (put down a wax paper barrier and they can use their hands). 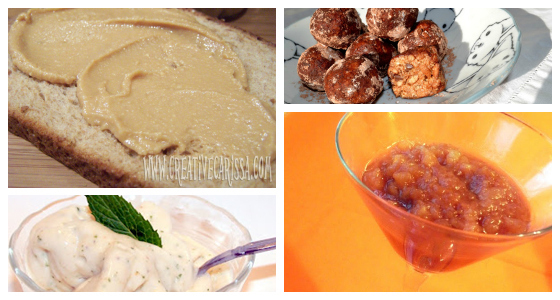 2: Healthy Creamy Apple Dip from C.R.A.F.T. This has only three ingredients (peanut butter, yogurt, cinnamon) and would be great for dipping organic apples into. 3: Personal Baked Apples from Having Fun at Home. You peel and core the apple and then let kids fill it with cold butter, cinnamon sugar (and I would add raisins and other dried fruit to the mix) before wrapping the whole thing pie crust and baking. Yum! 4: Peanut Butter Cracker Spiders from Mad in Crafts (scroll to the bottom below the costume). Even though Halloween is over, kids love insects any time of year. Up the health factor by using whole grain crackers and homemade peanut butter (below). 5: Peanut Butter from Carissa's Creativity Space. Peanut butter is super easy to make and a great way to connect kids with where their food comes from. Let kids pour the ingredients into the food processor and then press the buttons once the lid is locked on. 6: Crispy Almond Butter Power Balls from Rook No. 17. These are packed with calcium, omega 3's, whole grains, protein and antioxidants. Eat them right away or store them in the freezer for up to 3 months. 7: Chunky Cinnamon Crockpot Applesauce from Mad in Crafts. There are few snacks that kids seem to love more than applesauce. Making your own is really easy. In a classroom, you could set this up in the morning, cook it on high and have it ready to go by lunch time. 8: Banana Mint Ice Cream from C.R.A.F.T. We make banana ice cream in a similar way in our house and I LOVE how it tastes like ice cream when it's pretty much just fruit. Jamie adds honey to hers but we never do and find it's plenty sweet. 9: Whole Wheat Pita Pizzas from The Picky Eater. I love pita pizzas. Using pitas instead of dough makes this project easier for kids (and easier to do in a large group). 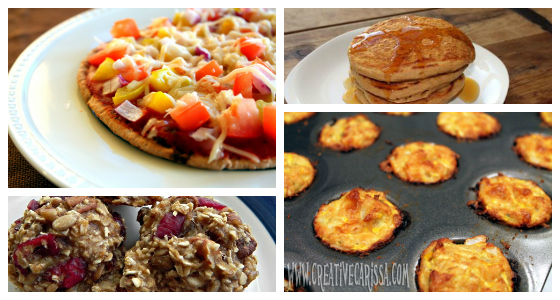 Give the kids plenty of healthy topping options and let them make their own masterpiece. 10: Pumpkin Pancakes from Modern Mom. This is a tasty way to get more veggies into your kids diet and they will love you for it. Leanna from All Done Monkey says you can do something similar with sweet potatoes for a different flavor and a boost of vitamin A. 11: Zots (Zucchini Tots) from Carissa's Creativity Space. These are great if you can find anyone with zucchini left (I personally have a large one still on my counter) or just pick one up from the store. These are a fun alternative to tater tots and easy for kids to help make. 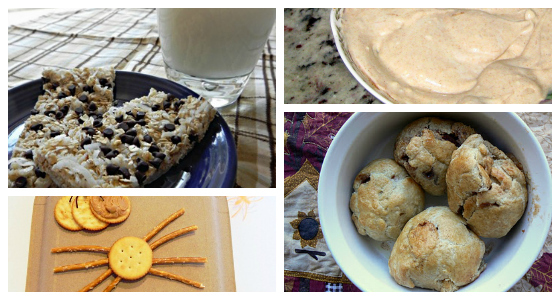 12: Healthy Breakfast Cookies from Mad in Crafts. These are full of fruit, seeds, and whole grains. Let the kids pick what to add and calling it a cookie makes them feel like they are getting a special treat. 13: Strawberry Yogurt Waffle Stack from Carissa's Creativity Space. As written, this recipe is sized for a grown up, but you can make it toddler friendly my using mini whole wheat waffles (we like the ones from Earth's Best). 14: Chewy No-Bake Granola Bars from Money Saving Mom. I love that you don't have to make these and you can add whatever mix ins the kids prefer. 15: Apple Cinnamon French Toast from Carissa's Creativity Space. Use leftover apple sauce from idea #7 and help your kids make a tasty apple cinnamon breakfast treat that tastes like dessert. Thank you for featuring, Carissa. Great idea for a round-up! 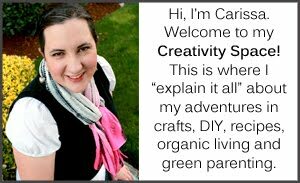 Carissa, I can't thank you enough for this wonderful feature! I'm pinning and tweeting your post.